We must avoid messages that are not OFFICIALLY approved by the Church. Currently there is an apparition fever in a lot of places. This is dangerous, because many believe more in what is said in a supposed or real apparition than what the Magisterium of the Church teaches; being that the revealed Truth ended with St. John, the rest are apparitions and private revelations that are not part of the faith and do not bind the believer. 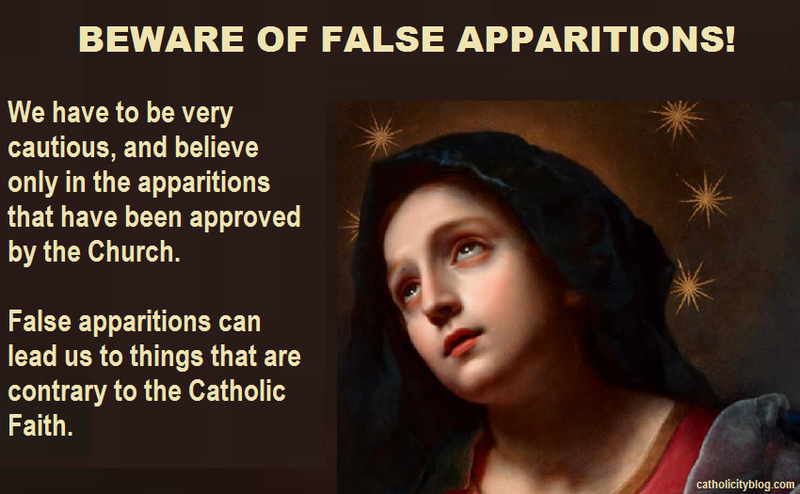 True apparitions cannot be in contradiction with the Revelation of God, made through the Bible or Tradition (that is, the teaching that comes to us orally and is not in the Bible) and guarded by the infallible Magisterium of the Church. Any doctrine against faith shows the falsity of the supposed "apparition", and if the contradiction is not so obvious, at least it makes it very doubtful. False appearances may be deceitful, or the evil one may be involved in them. The true ones will always be in agreement with the faith. The problem is that a lot of Catholics do not know their faith well and therefore do not easily notice when an error is expressed against it. Even when the doctrine is correct, we must wait for the definitive and official judgment of the Church. Remember that Christ warned us about the coming of false prophets. We must be cautious and not believe all that is presented to us as supernatural. It is not wise to advertise these issues until they have been approved officially by the Church, and not by the opinion of any priest. Our yardstick must be the Magisterium of the Church that guards the Divine Revelation, and not the apparitions. As long as the Church does not adopt a clear stance on each case, we must be cautious and not propagate everything that comes to us. In the meantime, we must discern that any message contrary to dogma is a sign of falsehood. We cannot absolutely deny the truthfulness or sustain the falsity of a certain apparition until there is an opinion of the Church, unless it contradicts the dogma, but in any case we must be cautious and sensible. Hence the convenience of not being eager for supernatural matters. 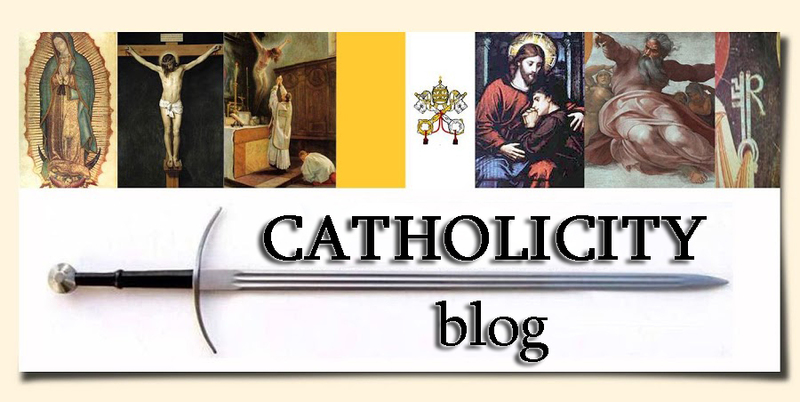 For a Catholic to be saved the Revelation made by God is sufficient. 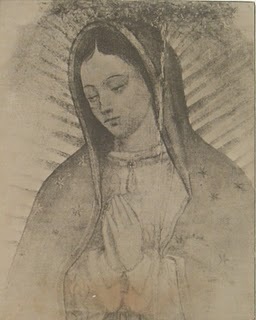 What joy to know that Our Lady has really appeared in places like Tepeyac in Mexico, in Lourdes, La Sallete or in Fatima, etc. Knowing that the Church has APPROVED these apparitions, we are the first to rejoice and to spread their maternal messages. Of all the others, let us be cautious; be careful, and very prudent.... Let us not spread something as true, when it is just being analyzed. In fact, not everything is genuine and authentic. Hence the need for prudence and discernment on the basis that all private revelation must be in accordance with the dogmas of our faith. The Revelation of God through Tradition and the Bible requires our complete agreement. Private revelations do not. The problem is that when there is contradiction, some people prefer the supposed private revelation over the Bible and Tradition. Those who do this, completely invert the values and get lost in “credulism”, and that can lead them to heresy, all this surrounded by an atmosphere of apparent and extreme piety. 1) Approved officially by the Church and, therefore, in full harmony with the dogma (another issue is a possible incidental error only of the seer, which does not directly contradict the dogma). 2) False. By deception of the seers, by diabolic intervention, by holding heretical doctrines, by mental disorders of the supposed seer, etc. The Church does not approve them. 3) Doubtful. 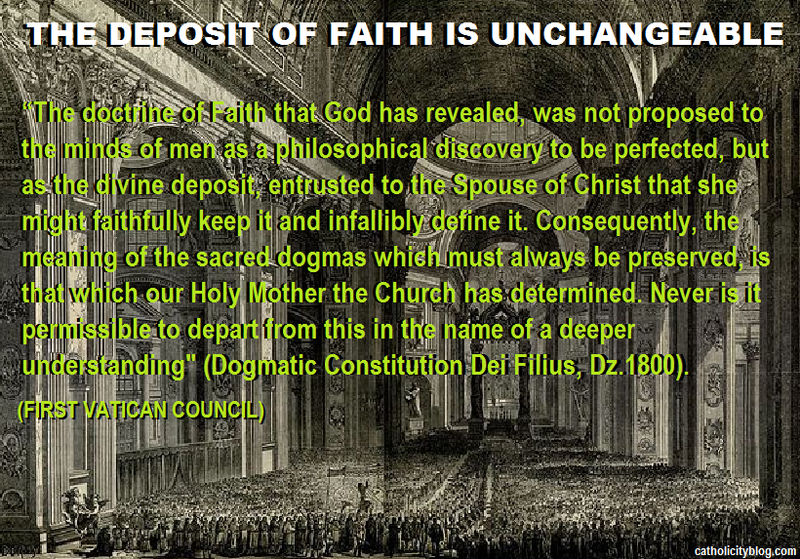 The doctrine does not contradict the dogma but there are elements that make them doubtful. The mistakes do not fall into the category of heresy and can be attributed to the visionaries and not to the messages received by them. They are under review. 4) Probable. They are also being analyzed. 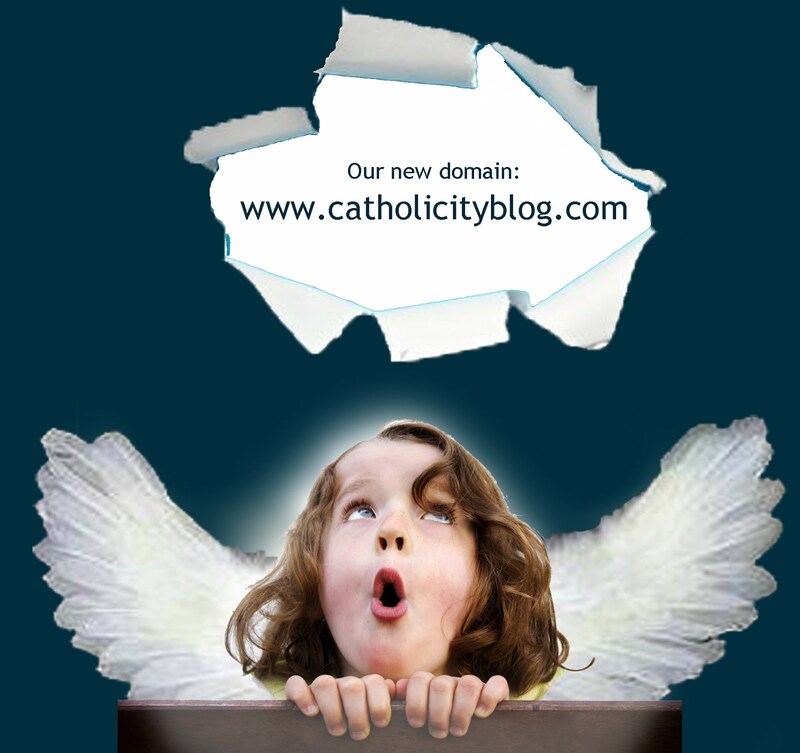 The doctrine is excellent and fully Catholic. There are many favorable fruits. In principle, no doubtful elements are observed. Notwithstanding all this, only the official judgment of the Church can assure us that they are approved, and not that of any particular criterion, however prestigious it may be who issues it. In any case, only the first ones can be fully secure. 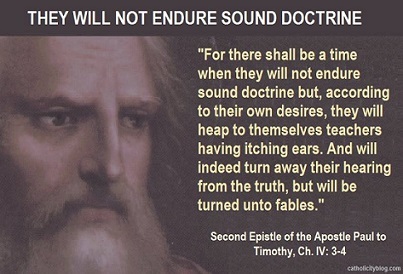 Remember that Christ warned us of false prophets, and in false appearances there are also false prophecies and false and heretical doctrines. The devil drags us using these means. He takes advantage of the piety of people to drag them to error and false devotions. There have even been schisms and antipopes as the product of these false seers, despite having begun in an atmosphere of great piety, with good fruits and conversions. 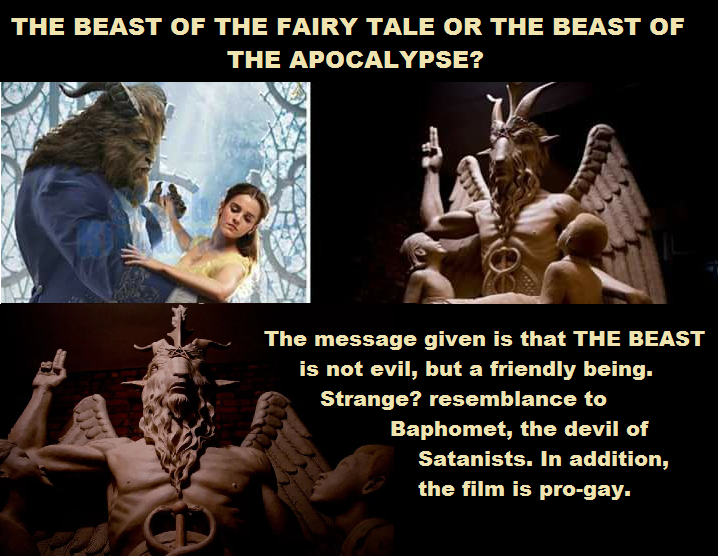 Let us not forget that the devil sometimes disguises himself as an angel of light, for he is the great deceiver. Therefore, let us be cautious, be careful, be very, very prudent... Let us not spread something as true, when it is just being analyzed. It is urgent to use discernment in the face of the alluvium of dangerous apparitions that swarm throughout the world. The martyrdom of the Virgin is set forth both in the prophecy of Simeon and in the actual story of our Lord's passion. The holy old man said of the infant Jesus: He has been established as a sign which will be contradicted. He went on to say to Mary: And your own heart will be pierced by a sword. 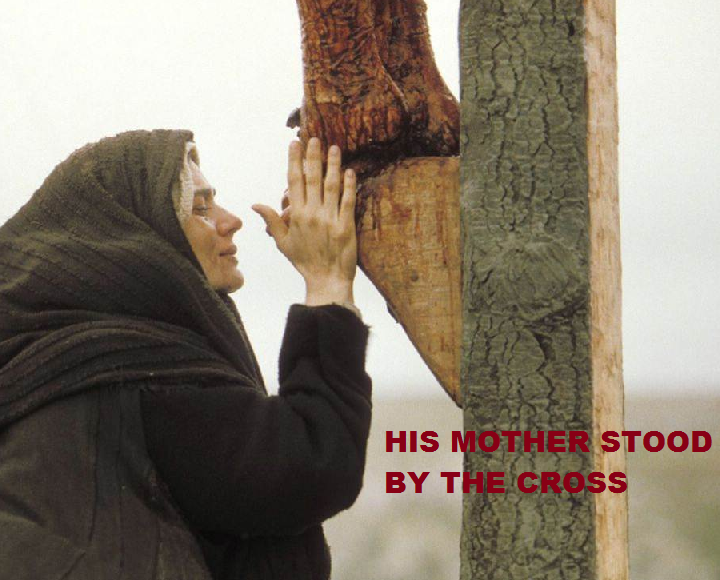 Lord, you have wanted the Mother to share the pains of your Son at the foot of the cross; Let the Church, associating with Mary to the passion of Christ, deserve to participate in His resurrection. For our Lord Jesus Christ. In 1998, almost half of the Disney staff was homosexual. This is confirmed by the former director, Michael Eisner, in a recent hidden camera video. Twenty years later the number may be higher. Perhaps that explains the LGBT contents of the company. The powerful gay lobby, which controls much of the entertainment industry in the US, has long since set eyes on the creator of Snow White, Bambi or Pinocchio. The largest factory of dreams for children is already dominated by the pink lobby. The latest is the new version of Beauty and the Beast, which has the presence of homosexuals - in a secondary role, but still homosexuals. But - as in the case of television - the phenomenon is not casual or spontaneous. More than 20 years ago, the animation factory has been filled with homosexual creators and many of the fiction contents are contaminated with this bias. Nearly half of the staff (about 150,000 employees) were homosexuals in 1998 - exactly 40% - as revealed by then-director of Disney, Michel Eisner. This data was made public during a conference to students in favor of LGBT laws at the University of California. The following lines are part of the video. As can be seen and heard, the executive director of the Human Rights campaign, Elizabeth Brich, states that the percentage of gay employees of Disney in the 1990s was 30%, but then former director Eisner corrects her and says that it was even greater: "You're wrong Elizabeth, it was 40%." It is a private event. And Brich makes it clear when she asks if it is being recorded and if she can speak with complete freedom. What she does not know is that a reporter had slipped in and recorded the event in a hidden way. 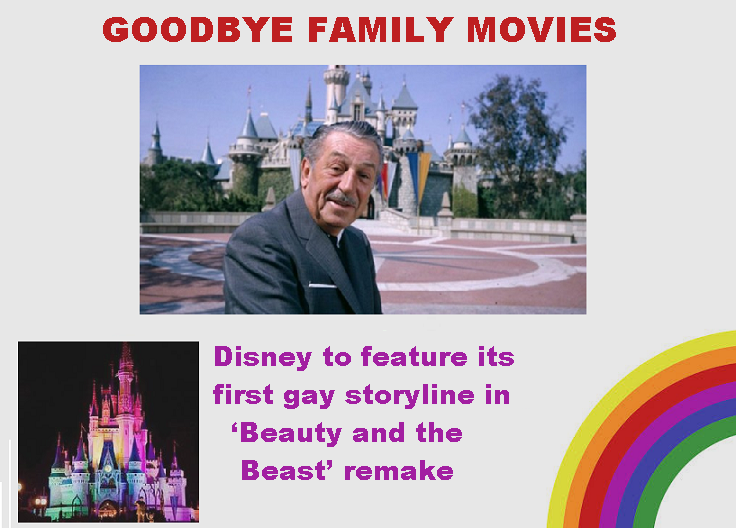 If we are talking about 1998 data, before the LGBT movement gained visibility, and before gay marriage laws were passed, it stands to reason that the percentage of the lobby within Walt Disney will have increased significantly today. In fact, the director of Beauty and the Beast, Bill Condon, is openly gay. And in the Disney Channel series, there are many LGBT characters, such as homosexual couples like Sheriff Blubs or Commissioner Durland of 'Gravity falls'. Disney has control not only of Walt Disney Animaton Studios or Disney Toons, but also of another major animation company, Pixar, world famous for films like Toy Story or Nemo. Star vs. The Forces of Evil. This program, aimed at children and teenagers, is aired on Disney XD, the cable and satellite television channel of the company. Source: Fr. Eusebio Hernandez Garcia, Jesuit priest, COMPLETE IGNATIAN EXERCISES, Vol. I, Meditations and Contemplations 4th edition, 1963. After Judas surrendered Me in the Garden of Olives, he wandered off and ran away as a fugitive without being able to silence the shouts of his conscience, which accused him of the most horrible sacrilege. When the news of My death sentence reached his ears, he gave in to the most terrible despair and hung himself. Who will be able to understand the intense pain in My Heart when I saw that soul throw himself to eternal damnation? He who had spent three years in the School of My Love learning My doctrine, receiving My teaching, and many times hearing My lips forgive the greatest sinners. "Ah, Judas, why do not you come and throw yourself at my feet so that I may forgive you? If you do not dare to approach Me for fear of those who surround Me, that mistreat me with so much fury, at least look at Me, and you will see how soon My eyes will look at you!..." "If out of malice you have perhaps spent a great part of your life in disorder or indifference, and close to eternity, despair wants to blindfold your eyes, do not let it deceive you; it is still time for forgiveness, and listen carefully! 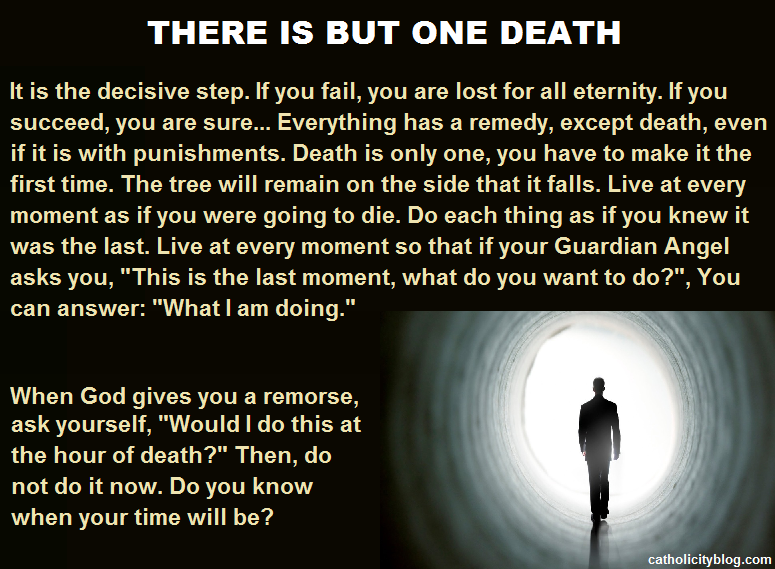 If you have but a second of life, take advantage of it, because in it you could gain eternal life...” (Editor’s Note: Making an Act of Perfect Contrition moved by love of God). "But one day receives a strong jolt that awakens it, and then its useless life appears empty, without a single merit for eternity. The devil, with hellish envy, attacks it in a thousand ways, filling it with discouragement and sadness, and driving it finally to fear and despair. 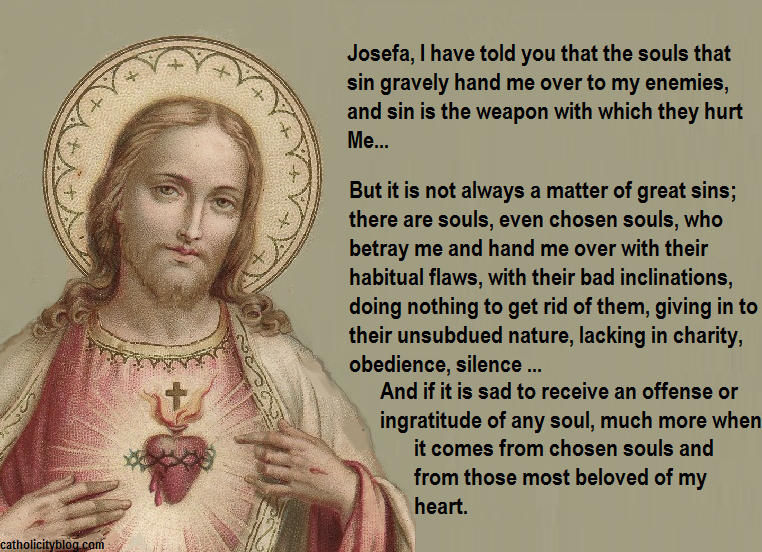 "Souls that belong to Me, do not listen to this cruel enemy!... As soon as you feel the movement of grace and before the fight is stronger, come to My Heart, ask it to pour a drop of its Blood on your soul. Come to Me! You know where I am, in the fatherly arms of your Superiors*. There I am under the veil of faith. Lift up that veil and tell me with complete confidence your sorrows, your miseries, your falls... Listen to My words and don not be afraid of your past. My heart has submerged it in the abyss of my mercy, and my love prepares new graces for you. Your past life will give you the humility that will fill you with merit, and if you want to give Me the best proof of love, trust in Me and count on My forgiveness. Believe that your sins will never be greater than My mercy, for it is infinite. " "Josefa, remain submerged in the abyss of My love and tell souls to let themselves be penetrated by those feelings!". *Our superiors are the priests who, through the sacrament of Penance, judge and forgive our sins. Coadjutor Religious of the Society of the Sacred Heart of Jesus. She received messages dictated by Our Lord in the convent of the Society of the Sacred Heart of Jesus in Les Feuillants, in Poitiers, France, between 1920 and 1923. In 1938, with the permission of the then Cardinal Secretary of State Eugenio Pacelli (future Pius XII ), the Publishing House of the Toulouse Apostolate of Prayer published Un Appel à L'Amour (A Call to Love), the biography of Josefa Menéndez, which includes her own records of visions, from which this text has been taken. 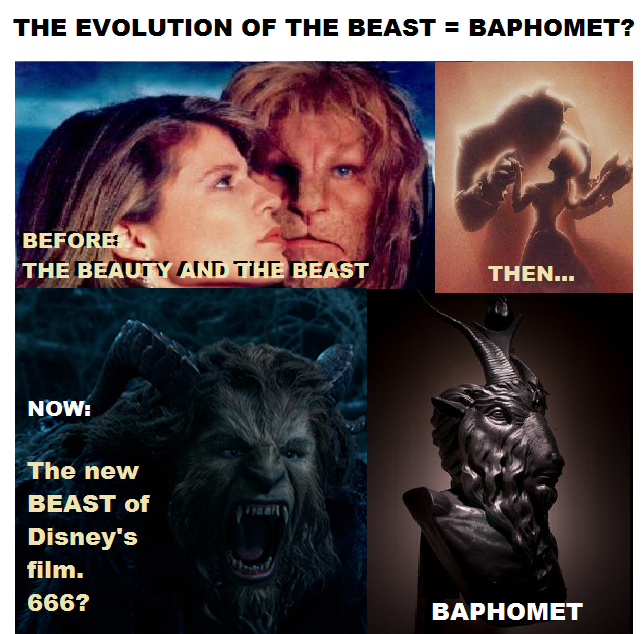 The Beast of the Fairy Tale or the Beast of the Apocalypse? WILL YOU TAKE YOUR CHILDREN TO WATCH THIS? (Voto Católico). Last Monday was the fourth year anniversary of the election of Cardinal Jorge Mario Bergoglio as Pope, and on this date Cardinal Angelo Comastri, archpriest of the Basilica of St. Peter, gave permission to the Anglican Protestant community of Rome to celebrate their vespers in the Basilica (See: http://www.catholicityblog.com/2017/03/the-vatican-has-been-desecrated-with.html). 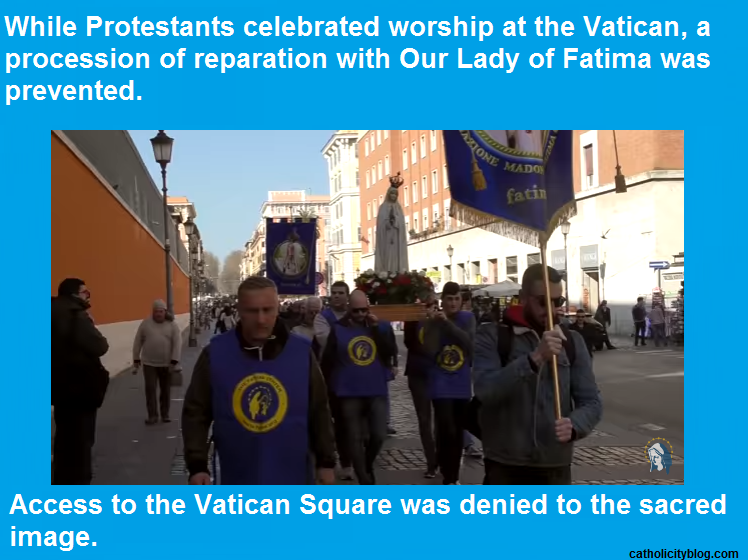 As an act of reparation, a group of young people from the Associazone Madonna di Fatima made a procession with the image of Our Lady of Fatima in St. Peter's Square. Although on the way to the square, the demonstrators were carrying banners with messages like "outside the Church there is no salvation", and handing out leaflets in which it was remembered that the Doctrine of the Church condemns the participation in the cult of the heretics, everyone left the things they were carrying before entering the Vatican. 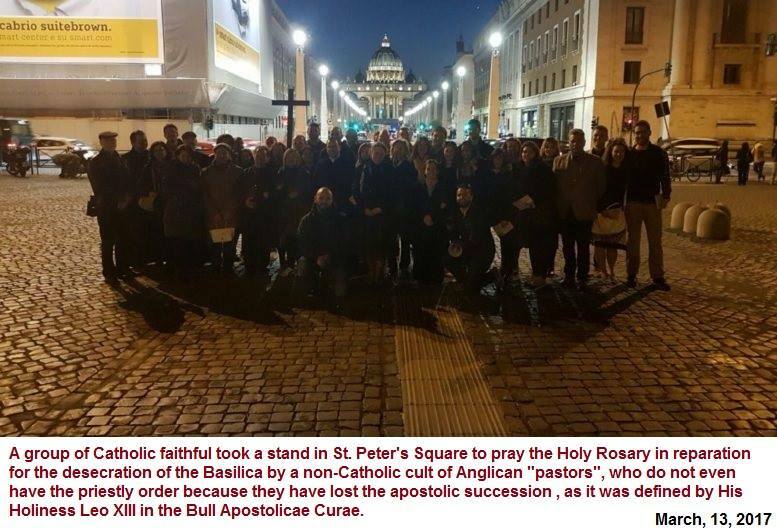 Nevertheless, while they were walking into St. Peter’s Square, they were approached by the police, and they were asked to leave the place. At the Anglican Vespers was present Bishop Arthur Roche, recently appointed by Pope Francis as head of a commission to review the document of John Paul II, Liturgiam Authenticam, on the translations of the liturgical texts. His presence generated suspicions among the Vaticanists, since it is rumored that the real purpose of this commission, is in fact a new reform of the mass to be able to “concelebrate” it with Protestant ministers, and to achieve the "intercommunion" that has been hinted at in several speeches of Pope Francis. PREPARING A FUTURE SYNCRETISTIC AND COMMON LITURGY? 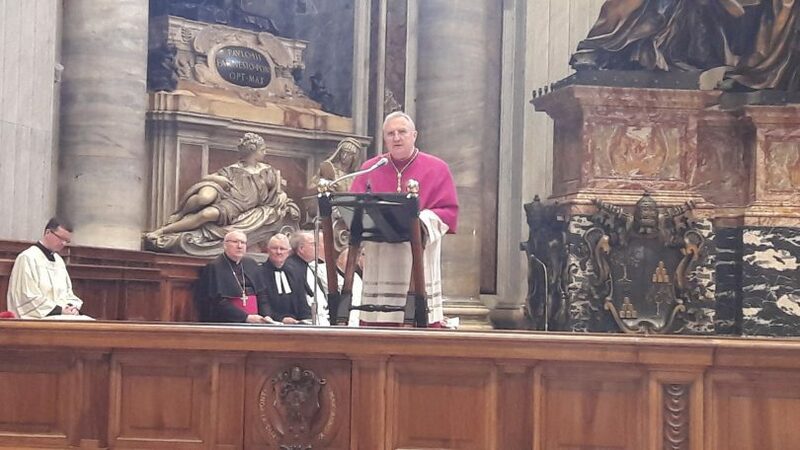 Just as CATOLICIDAD announced it on February 10 (2017), the desecration of the Basilica of St. Peter in the Vatican was carried out with the Anglican liturgy. 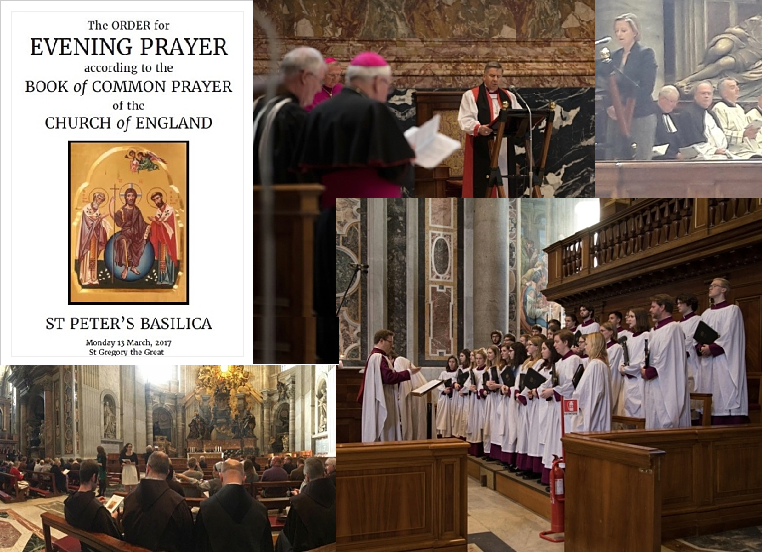 Here are some pictures of the event, including the poster announcing this act – not sufficiently advertised - that has been perpetrated according to the 17th Century Book of Common Prayer of the Church of England. Although there had already been acts of false ecumenism in Anglican temples (see links below), something like this had never been done in the most representative temple of catholicity. [Secretum Meum Mihi] Archbishop Arthur Roche, secretary of the Congregation for Divine Worship and Discipline of the Sacraments, and now head of a commission created by Francis with the aim of "relaxing the rules of translation of liturgical texts", but which in reality would have the mission of "reforming the Mass in such a way that it can be celebrated with Christians of other confessions", preaches about St. Gregory in the first Anglican Vespers celebrated on March, 13, 2017 in the Basilica of St. Peter in the Vatican (Image provided by Sally Axworthy via Twitter). Let’s contemplate that scene whose sovereign beauty shocked the angels, in the Last Supper. Jesus has just instituted the divine Eucharist... A shadow of infinite sadness... almost agony, clouds his adorable face...: he sees Judas there; the ingrate already has in his power the sum he has received to betray his Lord. Oh, and Jesus, pleased and comforted, rewarded that intimacy by reclining his adorable Heart in that of John, his apostle... and his friend!... In that moment of glory, He entrusted it to him, he certainly gave it completely to him... And since then, Jesus and John were united with an eternal bond... beyond life and beyond death!... Jesus is agonizing on Calvary!... At his feet, near John... closer still to the Immaculate Queen, Is... Magdalene!... On one side, the innocence preserved, and on the other, the recovered innocence!... 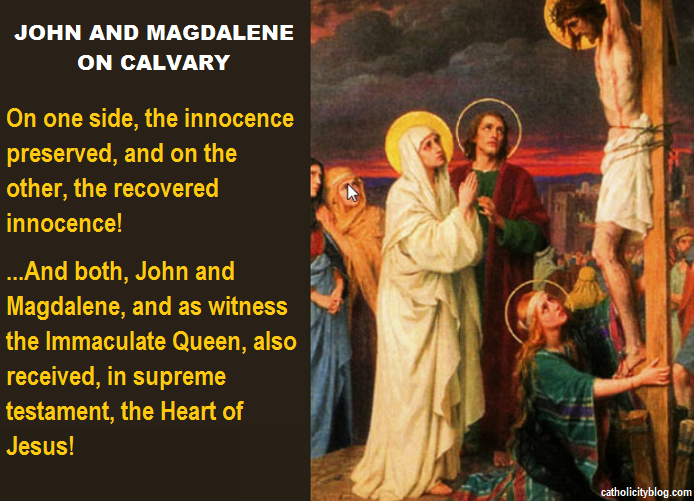 And both, John and Magdalene, and by witness the Immaculate Queen, also received, in supreme testament, the Heart of Jesus! Taken from THE HOLY HOUR, by Fr. Matthew Crawley-Boevey (1875- 1960). "The doctrine of Faith that God has revealed, was not proposed to the minds of men as a philosophical discovery to be perfected, but as the divine deposit, entrusted to the Spouse of Christ that she might faithfully keep it and infallibly define it. Consequently, the meaning of the sacred dogmas which must always be preserved, is that which our Holy Mother the Church has determined. Never is it permissible to depart from this in the name of a deeper understanding" (First Vatican Council. Dogmatic Constitution Dei Filius, Dz.1800). Here you have my Heart: I give it to you, I entrust it to you unreservedly, in exchange for yours, sinner and ungrateful... Oh, I am thirsty, I have an immense thirst to be loved, in this Sacrament of the Altar, in which I have been King of Silence, the Monarch of oblivion... But the time has come for my triumphs... I have come to regain Earth... Yes, I will subjugate it, despite Hell, and I will save it by the omnipotence of my Heart. 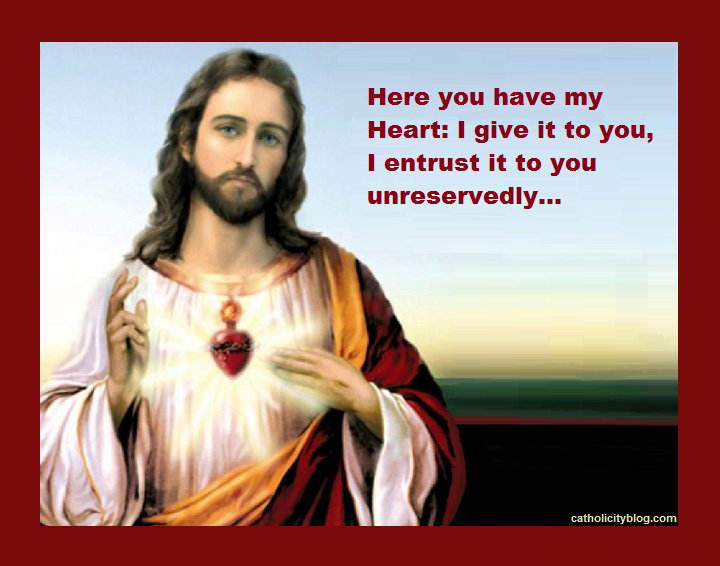 Accept It, I beg you... give me your hands and your soul to receive this supreme gift of my redemptive mercy... I am come to cast fire on the earth, fire of life, of boundless love, fire of holiness, fire of sacrifice, and what will I, but that it be kindled? Put your eyes on my wounded chest... there you have the Heart that has loved you to the lows of Bethlehem... and more; To the humiliations and darkness of Nazareth... much more so; even to the agonies of Calvary... This is the same Heart that stopped beating on Golgotha, yes, the same, that continues to love in the unquenchable bonfire of the altar... of the Holy Eucharist." Despite efforts made by the government of Kuczynski that tried to boycott the massive event. The event was attended by more than 24 regions of Peru along with the central event in the country's capital, whose attendance exceeded 1.5 million people. (ACI / InfoCatólica) The march carried out yesterday in Peru has been a complete success. 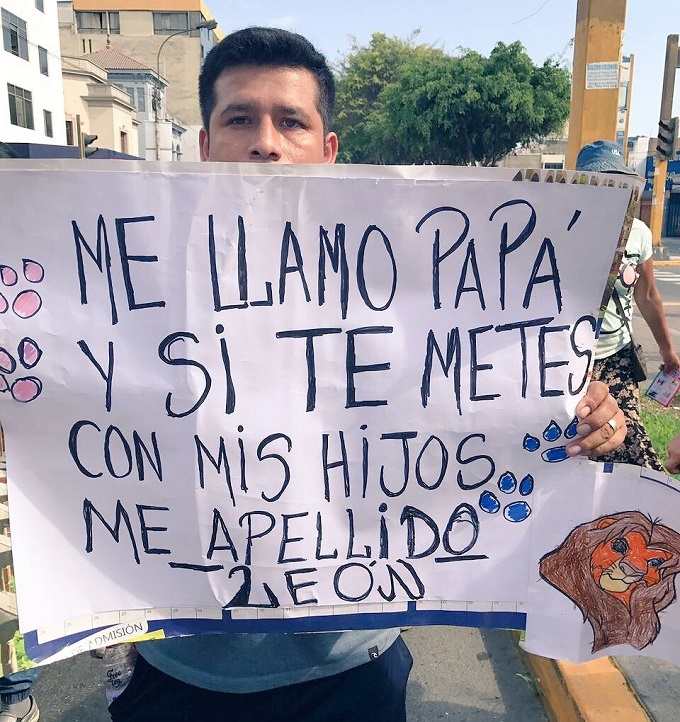 With the slogan #ConMisHijosNoTeMetas, (Don’t Mess with my Kids) has opposed to a section of the Ministry of Education, that wished to promote a National Curriculum for minors that included criteria related to gender ideology. 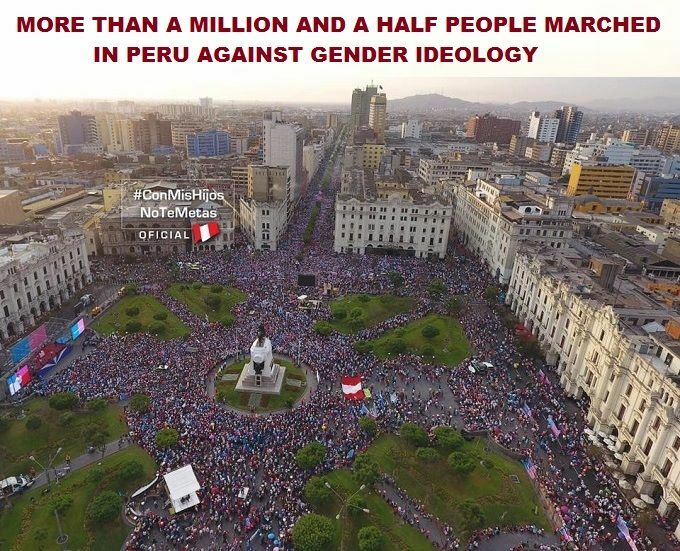 The event was attended by more than 24 regions of Peru along with the central event in the country's capital, whose attendance exceeded 1.5 million people, where the protesters with various banners and slogans critical of gender ideology covered the main districts of the Peruvian capital. 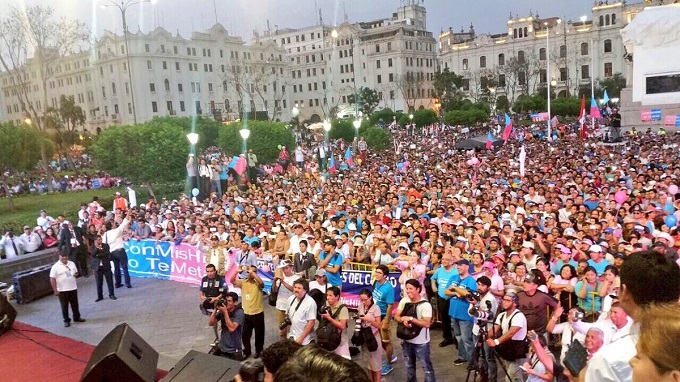 The march in Lima was attended by the Colombian deputy Ángela Hernández, who headed in Colombia, in 2016, a series of demonstrations against the indoctrination of children in gender ideology. The massive protests led to the resignation of the then Minister of Education of that country, Gina Parody. The Colombian MP urged Peru's President Pedro Pablo Kuczynski to listen to "the democratic will of the people and remove all the indoctrination related to gender ideology of the school curriculum" and "respect the right of parents to educate their children". Among those present were congressmen Julio Rosas, Carlos Tubino, Nelly Cuadros, Juan Carlos Gonzáles, Marco Miyashiro, Roberto Vieira, Federico Pariona and Edwin Donayre. The episcopal vicar of the Family and Life Commission of the Archdiocese of Lima (Peru), Fr. Luis Gaspar, stressed that "education, as the first right of parents to their children, is not negotiable." "We are in a moral war, in a spiritual war and the battlefield is the mind of the children, and we will defend it until the end of our days." Fr. Gaspar also invited the demonstrators to participate in the March for Life, to be held in Lima on March 25. The archbishop of Arequipa has also expressed itself strongly against the imposition of gender ideology in schools. The demonstrators also criticized the media, who often ignore or minimize the magnitude of the marches in defense of life and the family. March 2, 2017 (LifeSiteNews by Lisa Bourne) – Disney's forthcoming Beauty and the Beast cinematic remake will feature a gay subplot, according to the film’s director, thought to be a first in the film company’s history. Video (After minute 1.28 gay kisses are observed). Labels: Amoris Laetitia, memes, Uncomfortable Truths or Comforting Lies? I was preparing to give a talk and I decided to bring an orange to illustrate what I was going to say. - If I squeezed this orange as hard as I can, what would come out? - Do you think apple juice would come out of it? - No! (He said laughing). - No, not grapefruit juice. - What would come out of it? - Orange juice, of course. - Why? Why is it that when I squeeze an orange, orange juice comes out? - Well, it's an orange and that's what's inside. - True. Let's assume that this orange is not an orange, but it is you and someone squeezes you or puts pressure on you, and tells you something that you don’t like; this offends you and anger, hatred, bitterness and fear come out of you. Why does these come out? - Because that's what's inside. This is one of the great lessons in life: What comes out of you when life squeezes you, when someone causes you pain or offends you? If anger, pain and vengeance are the things that come out, it’s because that’s what’s inside. No matter who offends you, whether it is your mother, your brother, your children, your boss, etc. If someone does or says something to you that you don’t like, what comes out of you is what's inside. When someone squeezes you and love comes out, it’s because that’s what you have allowed to be in you. Today there is an orange for you and me. Now, we have to reflect what’s inside us, because " the things which proceed out of the mouth, come forth from the heart" [Matt 15:18]. 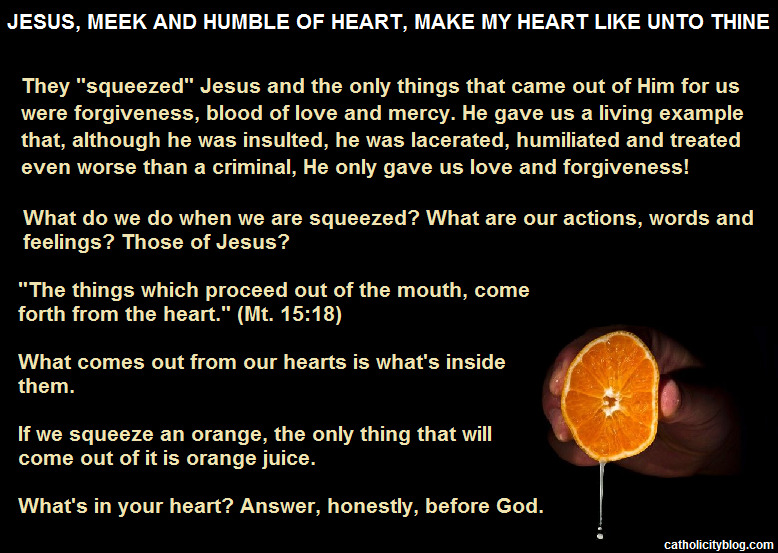 They "squeezed" Jesus and the only things that came out for Him for us were forgiveness, blood of love and mercy. He gave us a living example that, although he was insulted, he was lacerated, humiliated and treated even worse than a criminal, He only gave us love and forgiveness! What do we do when we are squeezed? What are our actions, words and feelings? Those of Jesus? "Jesus, meek and humble of heart, make our hearts like unto Thine."